WT title: "Egypt's Chance for Change"
If developments in Egypt have gone as well as one could hope for, future prospects remain unclear. The exciting part is over, now come the worries. Let's start with three pieces of good news: Hosni Mubarak, Egypt's strongman who appeared on the brink of fomenting disaster, fortunately resigned. The Islamists, who would push Egypt in the direction of Iran, had little role in recent events and remain distant from power. And the military, which has ruled Egypt from behind-the-scenes since 1952, is the institution best equipped to adapt the government to the protestors' demands. 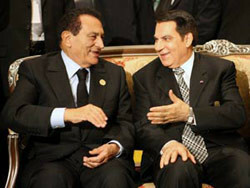 Egypt's Mubarak and Tunisia's Ben Ali, sharing good times. Now, for the problems. The military itself represents the lesser problem. In charge for six decades, it has made a mess of things. Tarek Osman, an Egyptian writer, eloquently demonstrates in a new book, Egypt on the Brink: From Nasser to Mubarak (Yale University Press) how precipitously Egypt's standing has declined. Whatever index one chooses, from standard of living to soft-power influence, Egypt today lags behind its monarchical predecessor. Osman contrasts the worldly Cairo of the 1950s to the "crowded, classic third-world city" of today. He also despairs how the country "that was a beacon of tranquility … has turned into the Middle East's most productive breeding ground of aggression." The Muslim Brotherhood represents the larger problem. Founded in 1928, the world's leading Islamist organization has long avoided confrontation with the government and shies from revealing its ambition to carry out an Islamic revolution in Egypt. Iran's President Mahmoud Ahmadinejad articulated this hope for it when he claimed that due to developments in Egypt, "a new Middle East is emerging without the Zionist regime and U.S. interference." In a bitter appraisal, Mubarak himself focused on this same danger: "We see the democracy the United States spearheaded in Iran and with Hamas, in Gaza, and that's the fate of the Middle East … extremism and radical Islam." For its part, the U.S. administration naively expressed no such concerns. Barack Obama downplayed the threat of the Muslim Brotherhood, calling it but "one faction in Egypt," while his director of national intelligence, James Clapper, actually praised the brotherhood as "a very heterogeneous group, largely secular, which has eschewed violence" and pursues "a betterment of the political order in Egypt." 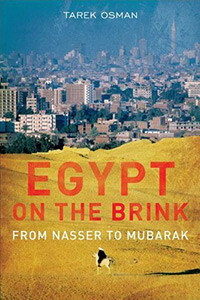 Cover of "Egypt on the Brink: From Nasser to Mubarak" by Tarek Osman. This nonsense points to a U.S. policy in deep disarray. In June 2009, during a would-be revolution against a hostile regime in Iran, the Obama administration stayed mum, hoping thereby to win Tehran's good will. But with Mr. Mubarak, a friendly dictator under assault, it effectively adopted George W. Bush's impatient "freedom agenda" and supported the opposition. Mr. Obama seemingly encourages street demonstrators only against our side. American pressure, steady and gradual, recognizing that the democratization process implies a vast transformation of society and requires not months but decades, is needed to open the system. What next for Egypt, and will the Muslim Brotherhood take over? Something remarkable, unpredictable and unprecedented took place in recent weeks on Egyptian streets. A leaderless mass movement galvanized large numbers of ordinary citizens, as in Tunisia days earlier. It did not rage against foreigners, scapegoat minority Egyptians, nor endorse a radical ideology; instead, it demanded accountability, liberty, and prosperity. Reports reaching me from Cairo suggest a historic turn toward patriotism, inclusion, secularism, and personal responsibility. For confirmation, consider two polls: A 2008 study by Lisa Blaydes and Drew Linzer found 60 percent of Egyptians hold Islamist views. But a Pechter Middle East Poll last week found only 15 percent of Cairenes and Alexandrians "approve" of the Muslim Brotherhood and about 1 percent support a brotherhood president of Egypt. Another indicator of this seismic change: the brotherhood, in retreat, has played down its political ambitions, with Yusuf al-Qaradawi going to far as to declare that preserving Egyptians' freedom has more importance than implementing Islamic law. No one can say at this early date where this revolution in attitudes came from or where it leads, but it is today's happy reality. The military leadership now bears the weighty responsibility of shepherding it to fruition. Three men in particular bear close watching, Vice President Omar Suleiman, Defense Minister Mohammed Hussein Tantawi, and Chief of Staff Sami Hafez Enan. We shall soon see whether the military leadership has learned and matured, and if it realizes that continuing to pursue its selfish interests will lead to further decay.